While visiting family in NJ, we shopped at Edison and bought jalebis at Sukhadia’s. 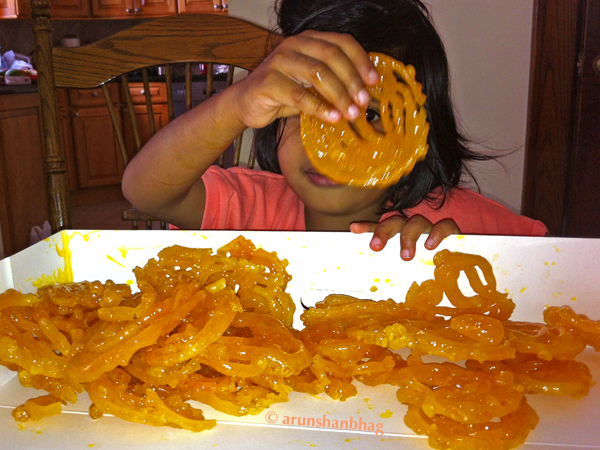 When we got home, Meera ripped open the box and dug into the jalebis, even as we were unloading the car. Yes, methinks all kids love jalebis. Nice, shiny spirals and oozing with sweet syrup. Hmmmm! Its been sometime since i visited your blog.. Meera has really grown up ! I used to relish these jelabis and other indian sweets while in Oregon , back in Bangalore now and find it hard to get good ones .. not just in terms of taste but the quality of stuff used. I am a little skeptical on the kind of preservatives and food colors they add into such things . Found that most of these additives are the main cause of allergies in children. When in Bengaluroo I’d stick to south indian desserts. In Mumbai and North, jalebis are definitely the best. Food color is being used for millennia. Preservatives I agree, so for jalebis (and all foods in general) stick to places where the turn over is very high and thus no need to “preserve” the foods. At Sukhadia’s (and most places in mumbai, fresh jalebis are made nearly every 15 minutes. Just returned from NJ. The food there is just amazing. Those jalebis were delicious. Did not realize that Meera would love jalebis. now I know. Hope you are doing well. Amma is coming to Boston next week, where will you be? Alas! Likely at home. 😦 Been job hunting for a month ish now, so I’m trapped here. I would love to see Amma, but I worry that another year is going to slip away! Goodluck with your search! Go west.